Tsunami , hits the coastal region of Tamilnadu on 26th December 2004, IWDI closely worked with the donor agencies and government machineries to bringing back the lives situation into normal in Coramandal coast area , Cuddalore, We had a chance to work in 25 coastal villages in cuddalore district . The systematic plan was prepared to meet the needs of the people who was affected by the Tsunami, their psychological, emotional needs were met by the trained staff team by IWDI . The series of activities were undertaken to address the needs of children, women, youths and aged members in cuddalore area. The Children those who are enrolled in schools got trained in the special schools established in 25 coastal villages, their material needs also met through supply of stationeries, books and uniforms. The Nutritious support was provided with the support of Donor agencies. Women Members were organized as a groups in their respective areas and trained in managing their organization, identified their needs and promoting livelihood opportunities for those affected. Integrated Women Development Institute is quickly responded for flood affected areas on 03.12.2015, the flood was affected the low line areas of Chennai, Thiruvallur , Kanchipuram and Cuddalore district ,this because of the unexpected rainfall during the month of December 2015 in Tamilnadu. The active response from the funding agencies helped us to serve the needy during the time of crisis. From 05.12.2015 to 08.12.2015, IWDI supplied 1000 food pockets with packaged drinking water with the financial support of Habitat for Humanity –India, Distributed food pockets in the most affected areas like Annai sathya nagar, New colony of koyambedu, Siva sakthi nagar and Villivakam . After the distribution the rapid survey was conducted to assess the needs of the peoples in the slums, and listed out and request was made to many donor agencies. Habitat for Humanity India, districted the emergency kit to 260 households in Rajiv Gandhi Nagar of Perambur and Sathya Sai Nagar of Koyambedu , This kits contains bedding, vessels , hygienic items and smoke less Chula. Further the infrastructure need was prepared with the technical staffs and submitted the proposal to Habitat for Humanity to address the needs of Infrastructural needs like repair and new construction. Humanitarian hum from Oxfam India reached the flood affected ground on 05.12.2015 to assess the needs, with their support we have cleared the debris at new colony, koyambedu . We have also supplied El-chlor tablet for to control the water related diseases in the affected areas, nearly 8000 tablets were districted in the affected areas. 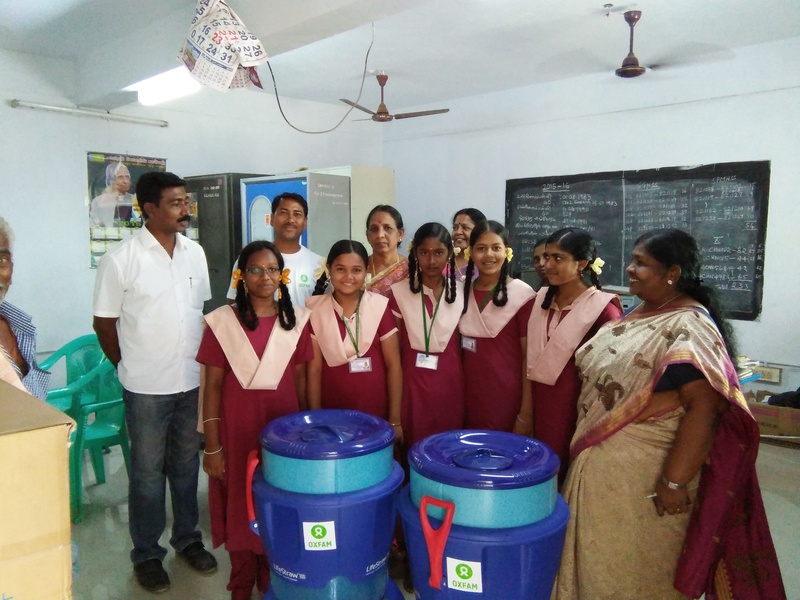 Shelter kits and hygienic kits were distributed to all the households at Annai Sathya Nagar slum with the support of Oxfam –India. Totally 673 families benefitted from this activity. Public health promotion activity in Annai sathya nGar started on 06.01.2016 and ended on 28.02.2016, this includes the construction of community owned public toilet unit in the slum. We have handed over the unit to user group on 04.03.2016.